Anyone from Mississippi will tell you that the Mississippi Delta has a very special feeling to it. In the past, the Mississippi Delta was full of vast antebellum vegetable plantations. Today it consists of parcels of smaller farms with crops like cotton, peanuts and soy. Like many buildings and structures in the area, these farms are remnants of its agricultural dominance of the past. However, you will find small towns that are sure to capture your attention scattered through the area. The Mississippi Delta runs from Vicksburg in the South to Memphis in the North and stretches miles east of the Mississippi River. Here you will find a variety of towns with deep roots in the Delta Blues that are sure to inspire your imagination. 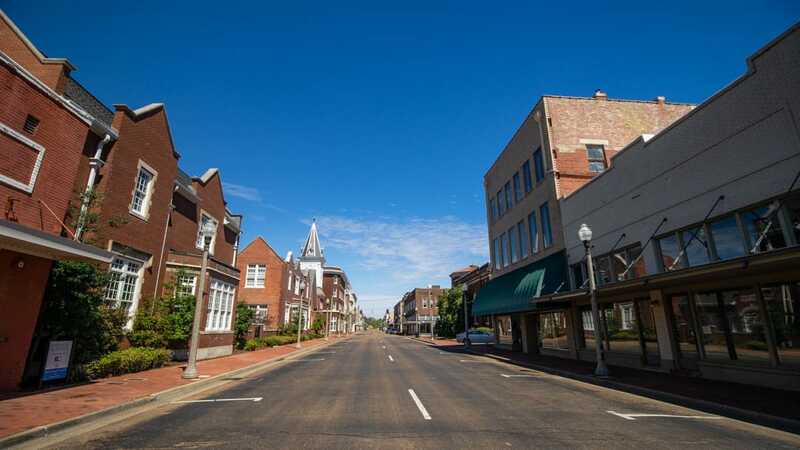 Greenwood is one such town in the heart of the Mississippi Delta that captivated us. Greenwood still has the look and feel of a picturesque southern small town. This is so much so that the feature film The Help was filmed in the town. Today you will find that many years later residents are still proud of this fact! However we went to Greenwood for a different reason. We had the goal to meet up Poe, a man we affectionately refer to as the Last Mississippi Delta Blues Disc Jockey. Poe owns a small, iconic radio station just outside of Greenwood. WABG, or “Awesome AM,” sits off a quiet strip of Money Road that leads through vast surrounding farmlands. Legend claims that a road like this is where blues guitarist Robert Johnson sold his soul to the Devil. When Johnson died at the age of 27 the legend continues that the curse of the “27 Club” was born. Legend claims that Johnson forfeited his soul to the Devil at the “Crossroads” in exchange for his musical talent. He is buried just one mile from WABG on Money Road. Many musicians such as Jimi Hendrix, Janis Joplin, Jim Morrison and Kurt Cobain are said to have met their fate in similar deals as between Johnson and the Devil. 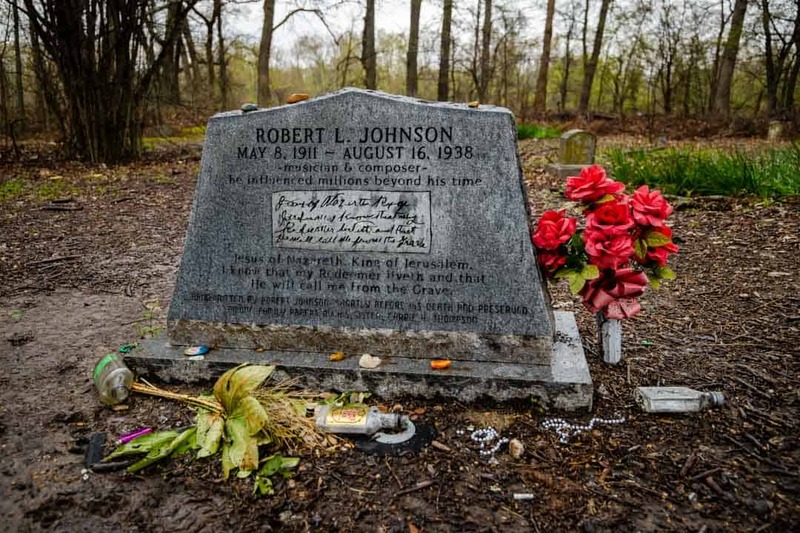 Robert Johnson’s Gravesite. Buried Next to a Large Pecan Tree. People From All Over Visit and Leave Trinkets in Honor of the Blue’s Legend. 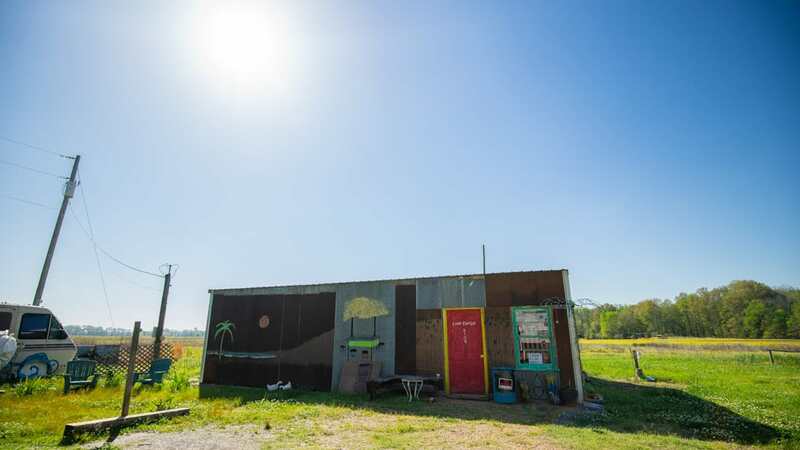 It’s worth a visit to the region if you are a fan of the Mississippi Delta Blues. 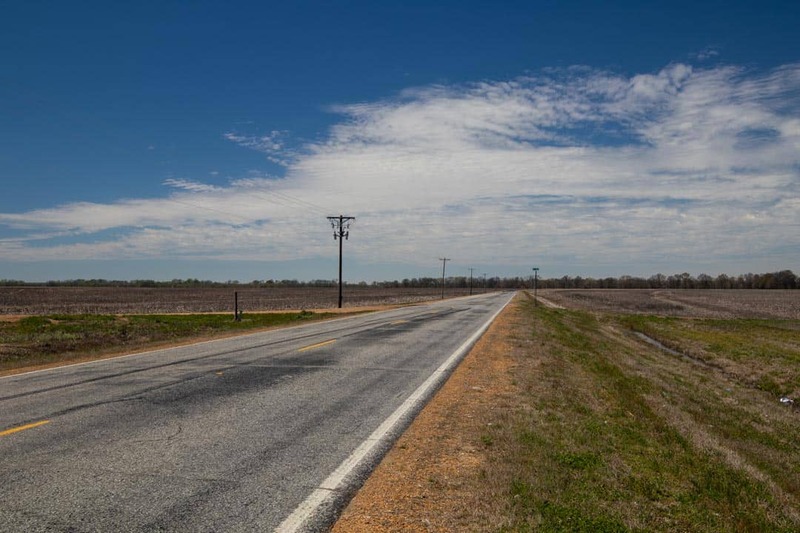 Or maybe you’re looking for long stretches of backroads on which to get “lost.” Perhaps you are interested in listening to live blues music at one of the regions “juke joints“? However, if for no other reason, you should plan a trip to visit WABG radio station. Park in the small gravel lot in front of the station and walk up to the front door. If Poe is not recording live, he’s likely to answer right away with a big smile on his face. As a result of stepping inside the station you will know why the Mississippi Delta is so special. It’s full of history – from oppression to dreaming – and those like Poe who live to carry on its unique and inspiring existence. 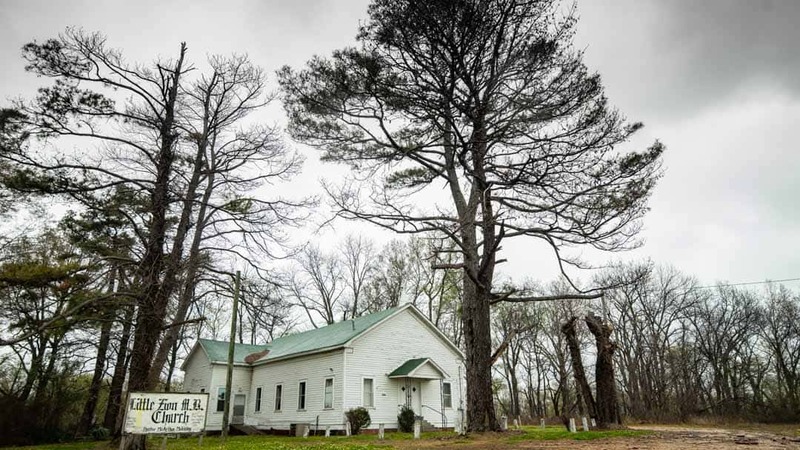 Little Zion Missionary Baptist Church, Off Of Money Road in Greenwood Mississippi. The “Supposed” Final Resting Place of Robert Johnson, The Legendary Blues Artist Who Sold His Soul to The Devil at The Crossroads. 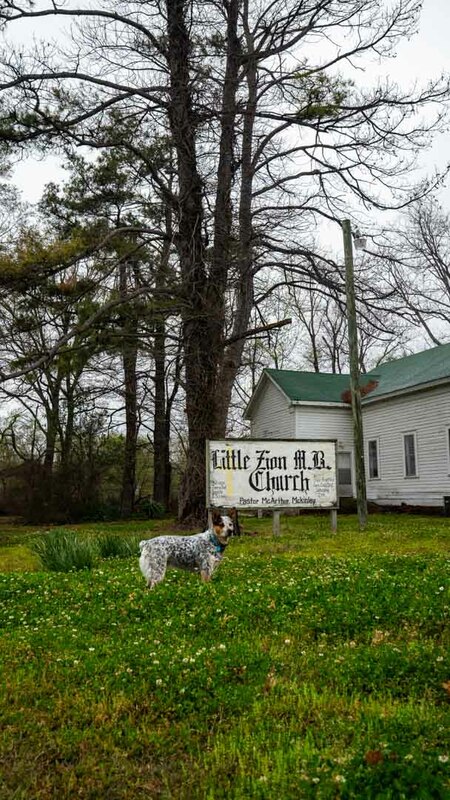 Everest Posing in Front of Little Zion Missionary Baptist Church. 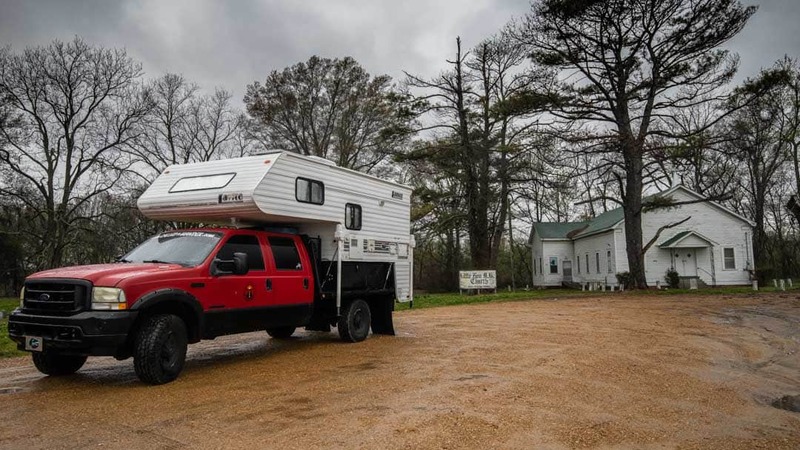 The Rig in Front of Little Zion M.B. Church, Home to Robert Johnson’s Final Resting Place. 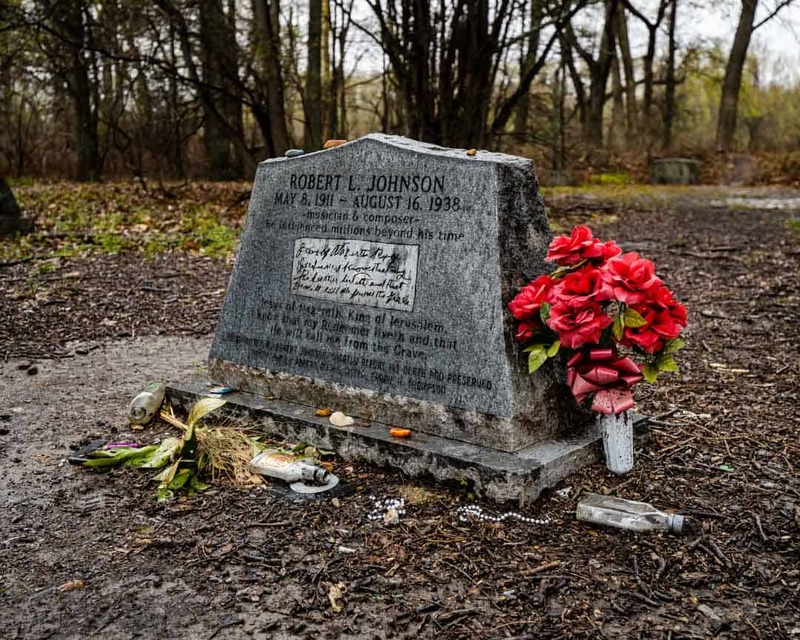 Trinkets Left in Honor of Robert Johnson Lie in a Muddy Mess Next to His Grave. Classic Juke Joint in Belzoni, Mississippi Owned and Built by Hand by Two Great Locals in Love with the Delta Blues.